Heavy-duty electric pencil sharpener features hardened steel cutting blades to ensure a good point every time. Unique angled cutter is designed for controlled sharpening. Auto-stop feature prevents oversharpening. Pencil sharpener offers easy-to-remove shaving tray. Built-in safety guard prohibits operation when shavings tray is removed. Dimensions (H x W x D): 4.3" x 3.5" x 7.5"
Transcript: This is the Stanley-Bostitch Desktop Electric Pencil Sharpener! Here is the final result of a pencil sharpened with it. Take your dull pencil and insert it into the sharpener. It will buzz away and sharpen the tip automatically for you. Remove the bottom tray from time to time to empty out the trimmings in the trash. When I used it, some of the trimmings still missed the receptacle, something to keep an eye out for. 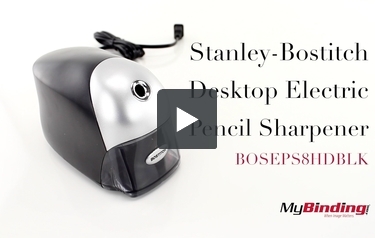 This is the Stanley-Bostitch Desktop Electric Pencil Sharpener! Here’s just a final look at the sharpener as a whole.